Back when I was a teenager and went to Disney World once a year, I would always walk by the France pavilion and imagine that I could someday eat French food in a faux French bistro in the middle of a theme park. I never had the extra money as a teen to dine at any sit-down restaurant at Disney World, so now that I am a money making grown-up, I get to try all of the restaurants that I want. I took a few semesters of French in high school, so recently I figured I would brush up on my skills at Epcot’s Les Chefs de France. My husband, Matt, and I were enjoying a lovely day at Epcot and got hungry for an early lunch. We did not have any reservations and had fully intended on getting counter-service for lunch. However, we walked by Chefs de France and glanced at the menu. We both agreed that it was fairly reasonably priced. We inquired inside very soon after it opened about getting a reservation. The very nice staff told us to come back in a half hour, and they would be happy to seat us without a reservation. When my husband and I came back to the restaurant, we waited only a minute and then were escorted to a table in the sunroom, facing out toward the wall of windows, giving us a great view of park guests strolling by. The restaurant is quite nice, but I did not find it intimidating. The walls and ceilings are made up of creams and golds, with dark wood dining tables. I really loved seeing the tables all set up with wine glasses and cloth napkins… so theme park fancy! Our waitress was really sweet and helpful. We felt like we got the best of the bunch with her. She took our drink orders and let us look over the menu for a few minutes. Matt decided on the Mahi Mahi Sandwich, and I very easily opted for the Vegetarian Lasagna. I have a serious obsession with lasagna; however, most times I avoid ordering it at a restaurant because I fear I will not like it as much as I like my own homemade lasagna. I must have been feeling super risky that day. Before our entrees came out, our waitress brought us a fresh baguette and some very generic butter. I was hoping for a little more adventurous butter, but I guess everything cannot be exactly as I want it, right? The baguette was very warm and hard to stop eating. Matt and I did end up waiting a little longer than normal for our entrees, but we did not mind since we were not in a hurry. Matt’s Mahi Mahi Sandwich had a really fun presentation. I love when the fries are not just thrown onto a plate. There was a fairly large cut of fish on the sandwich, along with nice thick bread. 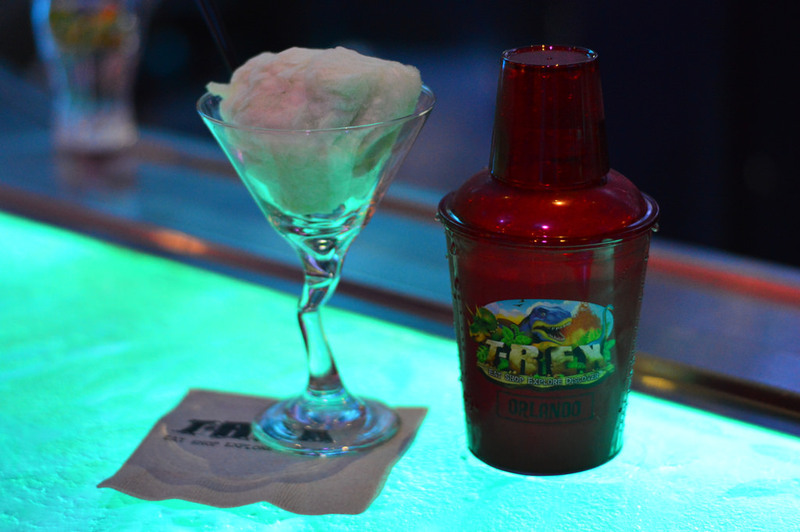 Matt said that while it was flavorful and filling, it was not his favorite meal he has had on Disney property. My entree, on the other hand, is definitely in my top five meals I have ever had in Disney World. The lasagna’a presentation was so beautiful that I did not want to ruin it! Thin slices of tomato and zucchini created a little wall around the lasagna, which sat in a relatively thin tomato sauce. The veggies inside were plentiful and delicious. My favorite part of the dish was definitely the cheese on top, but that is because I am a cheese-o-holic and should probably be in treatment for my addiction. Matt tried the lasagna, and I think he loved it so much he wished he had ordered that, as well. For $15, I definitely felt like I got my money’s worth. As we were paying for our meal, our waitress told us to sit tight for a few minutes because Remy from Ratatouille would be coming by our table soon. We are big Ratatouille fans in my family, so this was a real treat. Armond, the maitre d’ that brought Remy around to every table, was hilarious and made the experience even more fun. When he asked if I would like a photo, he began posing with my husband. When Armond revealed Remy, the little mouse squeaked and looked around. I think that Remy makes this relatively tame restaurant more interesting for children. I was so pleased with my visit to Les Chefs de France that I will definitely be back! 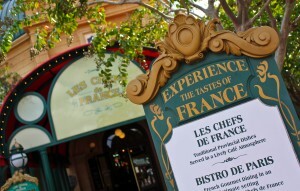 Have you ever dined at Chefs de France before? What was your experience like? Let me know in the comment section below! Born and raised in Southwest Michigan, Stacey believes she lives far too many miles away from Walt Disney World. In her spare time she enjoys singing/dancing, spending time with her nieces, and of course, talking about Walt Disney World to anyone that is willing to listen. She's been blogging about all things Disney since 2008. Follow her on Twitter @Stacey87. We ate their last year (2 adults) for lunch and loved it! We did the 3 course lunch which was a pretty large amount of food for us. The French onion soup was crazy good! This is one of our new favorites. My 5 year old LOVED Remy! The person escorting Remy (a lady) was very funny and great with our son! The food is very plentiful at this restaurant. And always good! Glad to hear your experience was better than ours. For years I had always wanted to try Chefs de France. I finally got the chance a few weeks ago. We scheduled our dinner as the last meal of vacation, figuring we’d go out with a bang. Needless to say, it was one of the worst and overpriced meals I’ve had in a very long time. I ordered the seared scallops and shrimp. The meal was very bland, not to mention skimpy. (I know french food is usually leans towards smaller portions, but for $32 I expected more than two scallops and three shrimp.) My daughter ordered a dish that was nothing more than slightly above average mac and cheese (for $18). The french onion soup was good, and my wife enjoyed her steak. Unfortunatly, I was incredibly disappointed, and would not entertain a return visit. We love it! We’ve never been when rent was there but I’m sure my kids would love it. Every time we’ve been the food and service were excellent. We have eaten here 3 times. I look forward to getting the beef short ribs every time. The “ordinary mac and cheese”, that was commented on, is what my daughter orders every visit. She is a total mac and cheese addict, and raves about it. Everyone has their own taste. My grandchildren also have a ball each time we see Remy. We make sure that we are in the restaurant when Remy is scheduled to make a visit. If you want a quiet dinner experience, try the new French restaurant, Monsieur Paul. This restaurant is very kid friendly, and can get a little noisy. Great restaurant, one of my favorites. My wife is French (and she cooks in the French style) and we have been to France several times and many items on the menu and their presentation do represent France well. My favorite times to go is dinner by the window during sundown where the French atmosphere really shows or for an early lite lunch of salad, bread and cheese, and a nice wine. 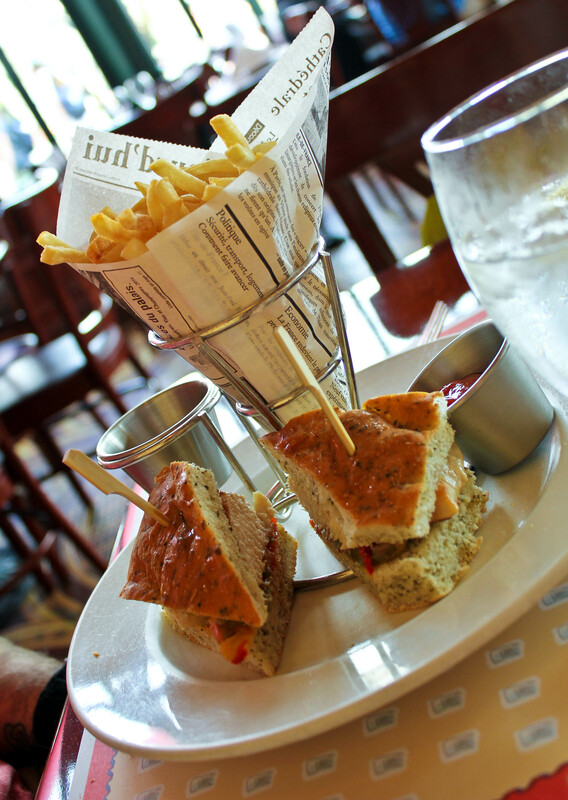 Try to engage with the staff to pick the French items off the menu to get the full experience. 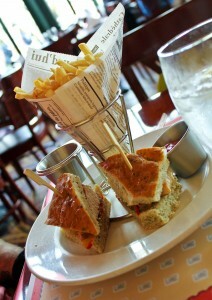 Many things are American food with French presentation. For example, a visit with my daughter when she was about 12 made an impression on people around us. She ordered the cheese plate, salad, and escargot for lumch and many people couldn’t believe she actually ate that stuff on purpose. It was funny. I had grilled cheese…. Is Remy always there or is it hit or miss?? It depends on when you will be there, Michael. This is the most current schedule I could find online. Monday through Saturday at 12:30, 1:40, 2:50 and 5:20pm. This was voted one of our best meals by my family during our Nov 2012 visit; good food, fun photos with Remy and thoughtful servers helped us celebrate a family birthday in a pleasant atmosphere-great combination! Thanks for the review Stacey!! 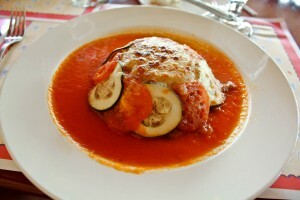 Planning our August trip and Les Chefs was on my short list of restaurants. I’ll definitely be making a reservation for lunch. I’ll keep the possibility of a Remy visit quiet just in case we miss him, but the kids would het a kick out of it if he stopped by! great review! we visit in April and will be trying to get a reservation here. I never really knew what ‘french’ food actually consisted of, so we typically avoided the france pavillion, but your options looked really good. Also, with three small children, the little mouse will be so much fun! I had no idea that there was character interaction here! Does Remy actually move or is it just a little statue? Remy moves and makes sounds (no actual words); you can find videos on YouTube and elsewhere, including at least one review I’ve seen. 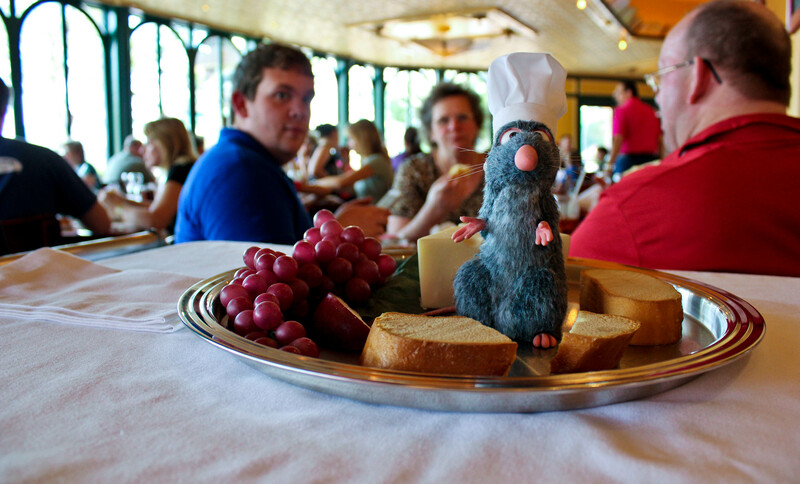 As a technicality, of course, he’s not a mouse but a rat (as in “Ratatouille”) – which is part of the humor: who wants to think of a rat even being in the restaurant, much less as the secret head chef? I haven’t actually seen him, but like Lizbeth, we’re planning a visit in August, and are planning to keep Remy as a surprise for our son, who probably won’t really be expecting to enjoy a meal in a French restaurant (but thank goodness, they serve macaroni & cheese!). I looked on youtube and it seems like Remy must be a puppet with the puppeteer hiding underneath the cart. We enjoyed seeing Remy, but I cannot recommend the food. I found it to be extremely bland, not well prepared and terribly overpriced. We tried the Lobster bisque, the French onion soup, the goat cheese salad, the quiche, the macaroni and cheese, and the mahi-mahi. Of those dishes we were only impressed with the French onion soup and even then I can safely say I have had better. My sons generally love going out to eat but they both found this restaurant to be unusually and disturbingly loud. I think it just has terrible acoustics. We were happy for a fun interaction with Remy because it helped cheer up my grouchy boys. My mom and I ate here about 4 years ago for lunch and I found it to be just ok for lunch. It was cute to see Remy and the waiters singing Happy Birthday to my mom in French was a treat for her. This past September, I had the duck with cherries and patty pan for dinner and let me say it was the dish everyone saw come out to the table and wish they had ordered. It was fantastic. Nothing edible was left on the plate. The chef met with my vegan friend and prepared something especially for him. I remarked that it looked like a dinner size portion of a Boston Market side item. That could be good or bad depending on what your expectations of vegan food at a French restaurant are. He enjoyed it. Not an adventurous choice, rather somewhere to go and be sure there’s more than one thing on the menu that’s an enjoyable option. Let’s he honest – Disney food is not the best but I think this restaurant is better than most. I enjoy it every time we go. Love the atmosphere too! We ate there last year. I loved it. It is officially my 11 year old daughter favorite place to eat. Period. It was a very nice and comfortable place to cool down and rest on a hot day in the parks! We went last November and it was very impressive. My father used to be a Cordon Bleu chef (MANY years ago) and we have been to France. It wasn’t just good for Disney, it was good! We all pretty much shared a variety of dishes, but I remember the cheese board mostly. I love cheese and it was a delicious arrangement. The bread that it was served with had nuts (I have an allergy) and it was no problem at all to substitute plain French bread. They were very accommodating to my 3 year old and we all LOVED Remy! 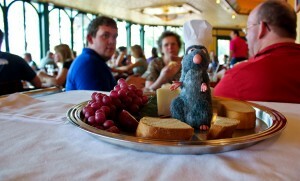 Most reviews I read complained that their meeting with Remy was rushed, but he was at our table for several minutes. His handler was hilarious and he was very nice to humor my father, who believe’s he is a comedian!